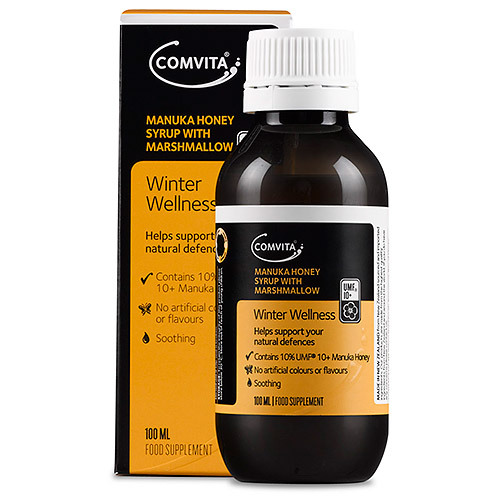 Manuka Honey Syrup with Marshmallow combines Marshmallow root extract (Althea officinalis) with UMF 10+ Active Manuka honey and Rewa Rewa honey, creating a soothing syrup. This all natural, non-drowsy formula is free of artificial colours and flavours. Helps maintain a healthy bronchial function. Each 5ml contains: Marshmallow extract (water, ethanol, dried Althaea officinalis root) equivalent to 0.39g dried herb, Glycerine, Rewa Rewa Honey, Manuka Honey 0.59g, Water, Thyme Flavour (water, ethanol, Thymus vulgaris herb), Menthol, Carrageenan Compound (carrageenan, dextrose). Adults: Take 5ml (1 teaspoonful) 3 - 4 times daily. Children: Take 2.5 ml (1/2 teaspoonful) 3 - 4 times daily. Not to be given to children under two years of age without medical advice. Below are reviews of Comvita Manuka Honey Syrup with Marshmallow - 100ml by bodykind customers. If you have tried this product we'd love to hear what you think so please leave a review. This product is always in my cupboard, would never be without. Told several people about it, we call it our magic cure. Excellent product - have been using it for years and only on the rarest occasions catch a cold. An excellent product - I use it daily, night and morning if necessary. This is a great product and I really believe it has got me through the Winter. I take one spoonful each morning before heading out to work. Another when I get home if feeling a bit tired/feel there is a cold coming on. Manuka Honey Syrup with Marshmallow combines Marshmallow root extract with UMF Active Manuka honey and Rewa Rewa honey.